With the Ford Transit Custom about to enter the North American market to be pitted against well-established commercial vans from Dodge, Mercedes, and others, Ford knows that despite its well-received European debut, the van needs to be better than average if it's going to sell. 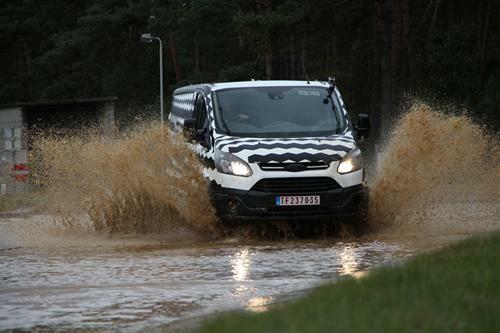 For the past six months, several Transit Custom vans have been put into torture testing in Belgium and surrounds. The goal was to put the equivalent of ten years of punishing use onto the vans in about six months. Everything from corrosion to speed to horrible roads were used or simulated to beat the vans far beyond anything the average customer would do to them. Using over 150 test drivers, the vans were subjected to continued battering by corrosive salt- and mud-baths, temperatures ranging from -40C to 40C (-40F to 104F), continuous maximum speed driving for six months, continuous figure eight turns, broken road simulations with potholes and speed bumps at 45mph over 5,000 times, crashes into curbs at various speeds (repeatedly), high humidity chamber soaking for weeks.. In short, the most cruel and unusual punishments that can be imagined for a car. From a car's perspective, these are the worst types of beatings, but this "tough love," as Ford calls it, has lead to over a hundred product improvements that will be integrated into the new Ford Transit Custom commercial van for the next model year. From Dubai to Finland, the vans were driven in all sorts of weather, road conditions, and more. One van towed a fully loaded (to maximum for the van) trailer for six months straight. The most significant improvements include a redesign and strengthening of engine mount brackets and body rocker panels. The improvements made after this torture testing will appear in the launch of the 2014 Ford Transit Connect Custom and Transit Connect commercial vans globally.